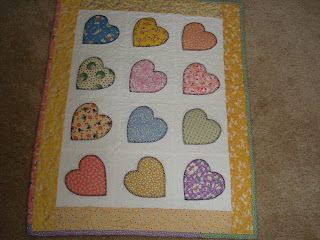 Here's a very simple doll quilt. My daughter decided the placement of the hearts. She wanted the purple heart on the bottom right to be flipped.So that is what I made. It's one of her little doll quilts so I wanted it pleasing to her. awww I totally love the fact that she wanted the purple heart turned. It gives the blanket character. Love it!